The affordable do-it-all rotary micromotor system! Great for polishing and texturing jewelry surfaces, sizing, drilling, stone setting, making beautiful bright-cuts and much more. Helps increase production, saving you time and money. Allows quick tool changes to keep work flowing. Provides finer control and better range of motion than a traditional flex shaft to handle especially delicate jobs. 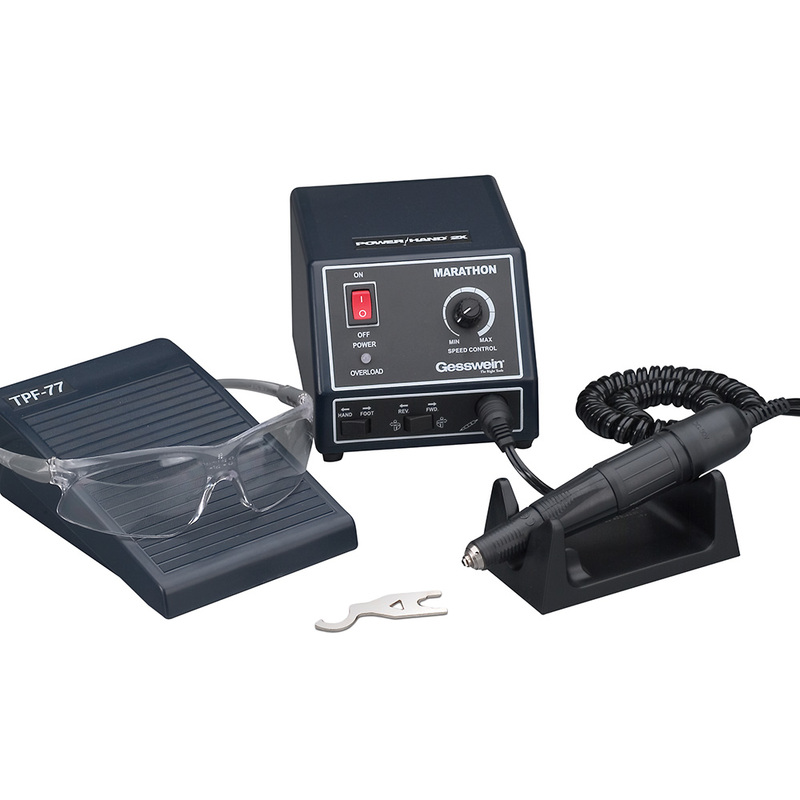 Includes compact 110/220V controller with dial speed control and forward/reverse direction switch, 35,000rpm lightweight rotary handpiece with quick-change collet and flexible curl cord, variable-speed foot rheostat TPF-77, handpiece cradle rest and safety glasses. Controller also accommodates our full line of Power Hand 2X Handpieces. Marathon is available with your choice of collet size: 3/32", 1/8" and 3.0mm (Collets are interchangeable.) For diamond "bright cutting", choose the Marathon System with 3mm collet and any of our Diamond Flywheels (see "Related Products" below). Made in South Korea. Collets and other parts for our popular Marathon Micromotor System are also sold individually for your convenience here: Marathon Micromotor Parts & Accessories.